This famous scene is spotlighted because it packs as much of a wallop as the beating dished out here by our hero John J. Macreedy (played with his customary thorough commitment by the legendary Spencer Tracy). Doubters of the one-armed man’s fighting method’s effectiveness (including at first, the star himself) might be surprised to know that a Marine instructor who saw the footage after completion told Tracy the karate blow if intentionally carried out, would have killed his adversary. Trivia buffs might also be aware of Tracy’s Oscar nomination for Best Actor in this film being denied a win by the same year’s competing performance by Ernest Borgnine (here playing Coley Trimble) in Marty. 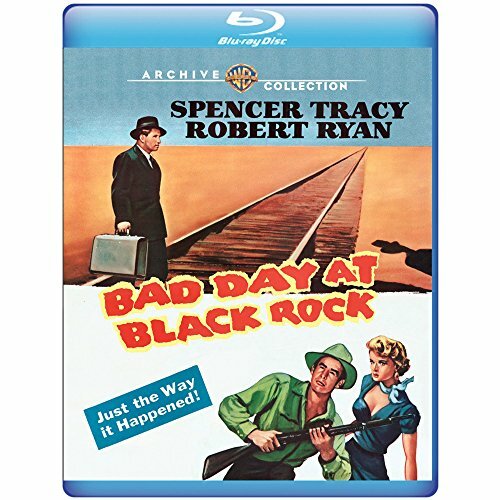 Finally, here’s a Trivia Question: As of this date, who is the only cast member of Bad Day at Black Rock still alive?